Please note: W width shoes may be marked as D-Medium which is equivalent to a women's wide width. 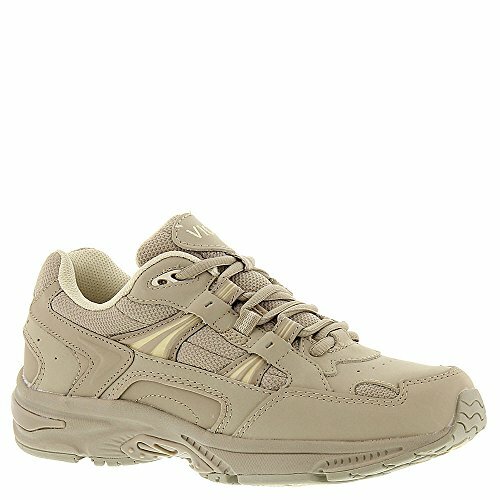 The Walker Womens sneaker is designed to keep you moving with maximum comfort and support. Received APMA Seal of Acceptance. Click here to view Seal. Full-grain water-resistant leather with contrasting overlays for a sporty appeal. Cushioned collar and tongue with traditional lacing provides a comfortable, customized fit. Breathable, moisture-wicking mesh lining with PU foam base that helps reduce friction against skin. Lightweight, flexible medium-density EVA midsole absorbs shock to reduce stress. Firm, thermoplastic heel counter provides increased stability and support for all-day wear. Durable TPR outsole with traction. Imported. Measurements: Weight: 13 oz Product measurements were taken using size 8.5, width M. Please note that measurements may vary by size. "New Balance Women's WW577 Walking Velcro Shoe,Bone,7 D US"